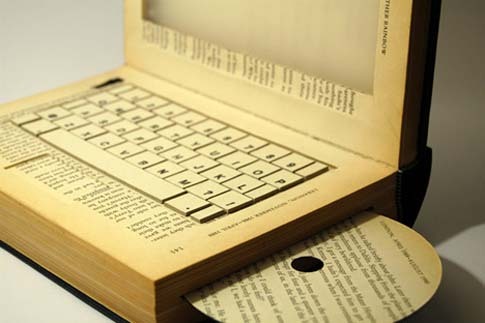 Flashforward 20 years into the future—what forms will our books take? Movies, music, videogames, and of course, books. All forms of media that are on the brink of change. The lines between them are blurring. Concepts and properties now routinely dip in two or more, often at the same time. It can be difficult to define what a specific title represents: is it a book? A videogame? Both? Something in between? Or everything all at once? 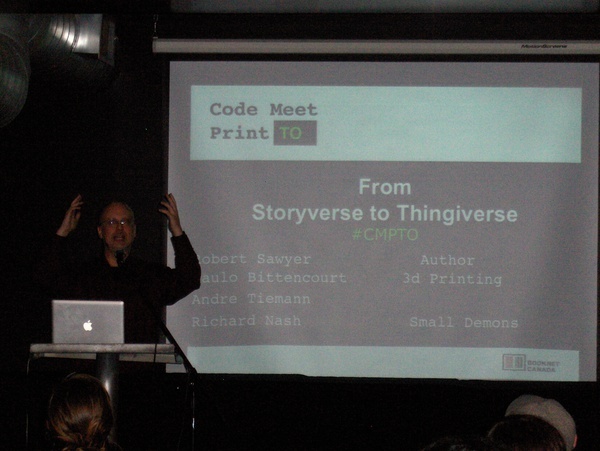 Such is the theme of the bi-annual CodeMeetPrintTO meetups—where publishing veterans and digital techies coalesce in a dark pub for drinks, appetizers, and an engaging discussion about the future of print. On May 7, 2012, I was able to attend the latest edition, "From Storyverse to Thingiverse: A Bookish Vision", which focused on the future of the book. With the divide between digital and print disappearing, will book publishers morph into content platforms, and ultimately, multiplatform conglomerates? Rob's answer: no, and that's in the best interest of both the publisher and the writer. For writers, it always makes sense to split the rights for their book so that the rights for a specific medium are handled by the organization that can do the work justice. For example, would you want a publisher to have the rights to a film version of your book, and spend $100,000 on the budget, or would you want 20th Century Fox to have them, and spend $100 million on your blockbuster epic? In Rob's opinion, publishing houses will never be multiplatform behemoths like Lucasfilm or Disney. Book publishers should stick to what they do best: getting great books on shelves and setting them up for success. Another question: what about the increasing interactivity of books, as they appear in e-book or app form? Will the future of books result in media-laden narratives that force "users" to participate rather than sit back and consume? No, says Rob. And that's because they are already pretty interactive as they are. Think about what happens when you read a book. The author gives you a basic description of the setting, the characters, and the dialogue and movements that happen in each scene. But they don't give you the complete picture. That picture forms not from the pages of a book, but within your mind—you see what your mind sees. Books are in fact a theatre of the mind. Because of that, reading a book is, in its essence, an interactive, collaborative experience between the author and the reader. Each person will experience a book differently than the person next to them, each person influences the story with their own background experience and imagination. How much more interactive can you get! Okay, okay—but what about the advent of hypertext fiction? Won't that change the way in which people read books? Won't it take a linear process and turn it into one that jumps from place to place and allows the reader to make choices that will impact the course of the story? No way, says Rob. Want evidence? We already have books like that. They're called Choose Your Own Adventure titles, and they operate just like hypertext fiction by allowing the reader to choose the path they take through the story. But guess what: they're not on anyone's best-seller list. Why? Because books are, at their heart, tales spun by a storyteller. Whether it's Homer reciting the story of the Trojan War as an oral poem, or Robert J. Sawyer writing a near-future novel about the future of the internet, the storyteller has always remained in complete control of the story. And that's the way their audiences, in most cases, like it. They trust in the storyteller! What an interesting thesis Rob had to share, huh? And to cap it all off, his final thoughts on the future of the book were very simple. Books have endured, will continue to endure, and they are a form of media that will always exist on their own. What are your thoughts on the future of the book? Do you agree with Rob? Please leave your comments below! Thanks Mark! You had some great thoughts on how technology and books are colliding as well - ZOMBIE RUN!!! - I wonder if people are ready for it, though!! I'm going to agree with Mr. Sawyer. To take the example of hyperlink books, I would suspect that many people, possibly even myself, would get lost in following the links. To me, at least, books are linear stories even when they follow multiple characters. Each jump in time, location, or POV causes a minute stutter in the story. Usually that is all it is, but I can envision a hyperlinked book being nothing but stutter steps. That would be painful. Hey Paul, thanks for sharing your thoughts! You make a great point. Books are meant to be finely-woven narratives, even when they multiple threads of plots and transition to different points-of-view. My favourite example of this is Bram Stoker's Dracula - essentially just a collection of diary entries. The story jumps around in time and the POV is always changing, but everything combines for a riveting story. Stoker knew what he was doing!